When I was working towards opening Blue Rain Designs, WordPress was young and rough around the edges and most people thought it was “just a blog”. But it showed amazing promise and I felt it would be THE platform moving forward and hitched my wagon to it. I’m obviously glad that was the case, as WordPress has become the most widely used content managed system and now powers 26% of the web. 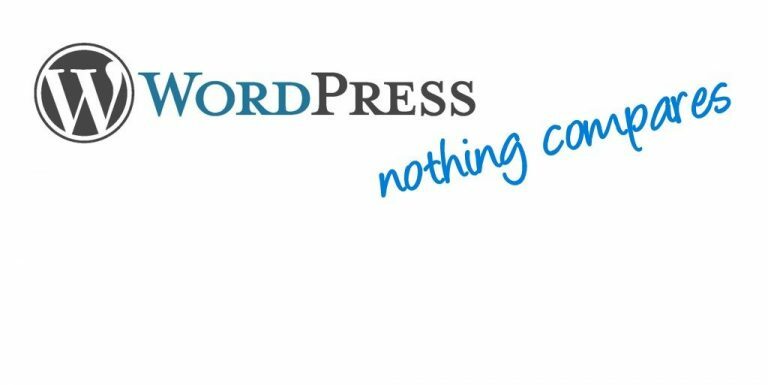 Over 1/4 of the internet is now running on WordPress. It blows away the competition – an early rival of WP, powers just 3% of the web. So why has it grown like this? It’s an open source framework we can use to build virtually any kind of site, it’s really that versatile and powerful. So whether a small “brochure” site, a business directory, web forum, large online store, or pretty much anything else, WordPress is what to build with.For flexibility it just can’t be beat, with 46,657 plugins (at the time of writing this) there is software available to build almost any site function into your site. A huge advantage is that with a WordPress based site, your site is able to expand, grow, and change if needed, without needing to rebuild. For example, say you want your (WordPress) site for your hair salon to start selling products online? No problem. We just add to the existing site, build in the ecom system, and now you’re running your online store. Not like before where we’d have rebuilt the site, costing you more. And I haven’t even touched on the other strengths of WordPress. SEO. The WordPress system is very search engine friendly, making it easier for your site to start climbing up. I generally see WP sites climb in Google Page Rank faster than other platforms. As for security, it’s a very secure platform which can be made even more secure with site hardening plugins/configuration. And for the site owner, WordPress is without a doubt the most user friendly system available so if you want to self manage your site you’ll be able to do it.